Researchers from the Japan Synchrotron Radiation Research Institute/SPring-8 in collaboration with scientists from Finland, Germany, and the United States have created liquid cement that has the conductive properties of metal. SPring-8 is a synchrotron radiation facility located in Japan and is operated by the Japan Synchrotron Radiation Research Institute. 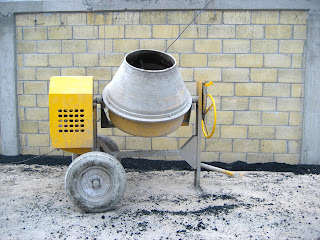 Cement is a substance that sets and hardens independently. It helps bind other materials together such as it does with concrete when it is combined with limestone, granite, or sand. The recent discovery means that this type of conductive liquid cement can lead to semi-conductors that have low energy loss and is easy to mold into different shapes and configurations. Possible applications in electronics for this material can be developed in LCD monitors, protective coatings, and even in computer chips. In a move that would make the Alchemists of King Arthur's time green with envy, scientists have unraveled the formula for turning liquid cement into liquid metal. This makes cement a semi-conductor and opens up its use in the profitable consumer electronics marketplace for thin films, protective coatings, and computer chips. The results were reported May 27 in the journal the Proceeding of the National Academy of Sciences in the article "Network topology for the formation of solvated electrons in binary CaO–Al2O3 composition glasses".